Faisal Hoque :: Innovative enterprises build a culture that embraces a left-brain/right-brain approach to creative thinking, executing, and communicating. Innovative enterprises build a culture that embraces a left-brain/right-brain approach to creative thinking, executing, and communicating. Apple, Inc., didn’t invent the personal computer. Instead, Steve Jobs and Steve Wozniak borrowed and adapted innovative concepts from others and mashed them up with ideas from within. Everything Apple did, from its auspicious beginnings in the late 1970s pairing a ho-hum Apple II computer with a third-party spreadsheet application called VisiCalc, has been successful because of cross-boundary collaboration and powerful doses of innovation. That is true not just of its computers but the mouse, the graphical user interface, the portable MP3 player which became the iPod, buying an online music distribution service and calling it iTunes, the iPhone, the iPad. Using the single letter i, Apple branded an entire lifestyle and created continuous, leveraged, sustainable innovation that has turned it into the most valuable technology company in the world. Apple is just one example of a company using cross-boundary collaboration to inspire and sustain innovation. My cross-industry research repeatedly found that enterprises with an emphasis on innovation often performed better financially and were better able to weather economic change than are stagnant, insular organizations. Cross-boundary collaboration exists in an environment where ideas are celebrated and anyone is welcome to contribute, regardless of their position or group, either within or outside the enterprise. It thrives in a culture where business and technology have successfully converged to accomplish the organizational goals and missions. Sustained innovation is a high-productivity state in which an organization is capable of innovating in all aspects of its business: management, divisions, operations, customers, and suppliers. 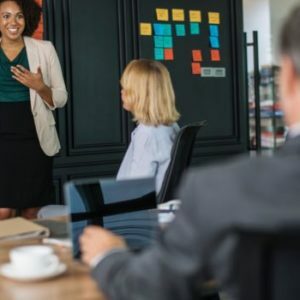 It requires a seamless, structured management approach that begins with board- and CEO-level leadership and connects all the way through technology investment and implementation. While collaborating for innovation is not a new concept – in 1943, Lockheed’s skunkworks team created a new WWII fighter jet in just 143 days – it’s one that apparently begs to be rediscovered over and over. In the 1980s, Texas Instruments (TI), a leader in semiconductors, found itself lagging in its innovation. It formed an official collaborative development group, The Lunatic Fringe, tasked with bringing the company back from the brink. Today, the group’s mission is to continuously find new uses, opportunities, and ventures for TI technology. Above all, sustained innovation is a journey, not a destination. Leaders and enterprises often believe they’re successful when they launch an innovative service or product, then rest on their laurels. They fail to recognize how quickly the competition can overtake them. The enterprise cannot stop innovating after attaining one goal; rather, it’s in a continual, profoundly creative process of creativity, reinvention, and discovery. 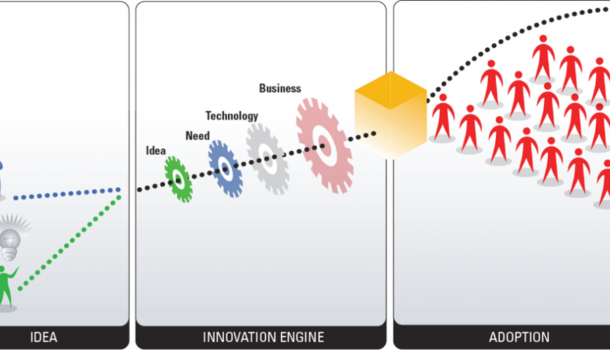 Sustained innovation also depends upon business-technology convergence for success. Its essential contributions are resiliency, agility, and the ability to be adaptive in the face of constantly changing business conditions. Personas, real and virtual, help challenge assumptions as the innovation lifecycle unfolds. Some are analytical, some are creative; others are a combination. Not all innovation teams require all personas, and teammates can adopt or change personas during the process. Cross-boundary collaborative groups require a firm foundation and a powerful set of tools with which to perform their work. They must have the assurance that technology has been carefully chosen and successfully merged with the enterprise goals and objectives. We call this an enabling technology. For example, a well-stocked information repository is an asset, but it is enabled by query tools that are easy to learn and deliver prompt, productive searches. Step 1: Improve strategic planning, business leadership, and management capability to mandate and support relentless innovation. Step 2: Encourage creative thinking and creative problem-solving to encourage rapid idea generation and diffusion across the enterprise. Step 3: Drive rapid development of new and improved products, processes, or services that cultivate customer intimacy and build service dependency. Step 4: Enable higher productivity, performance, and growth through collaboration; capture and adopt the resulting new learning practices. Step 5: Develop new business models that aid in differentiating the organization’s core offerings from those of its competitors. Innovation is not a luxury: it is essential for any enterprise moving forward. Cross-boundary collaborative teams, working with enabling technologies, can drive it.